Professional cleaning power without the use of chemicals that leave harsh residues and fumes. 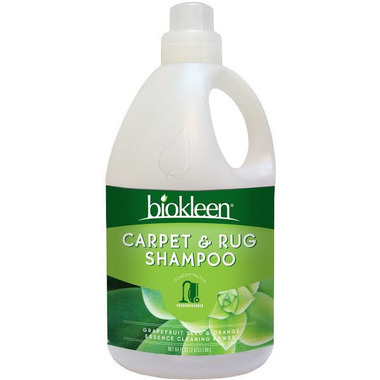 Extracts of citrus, grapefruit seed and plant-based surfactants clean tough stains and odors trapped on and in your carpet. For use in home, rental or professional carpet cleaners. Grapefruit seed & orange essence cleaning power. Leaves no harsh residues or fumes. No artifical fragrance or colors. For home rental machines add 2-4 full caps to each gallon of water. Clean according to user guide. For commercial extractors add 2-4 cups to 5 gallon stock tank. Dilute at 100 gallons through wand. For commerical portables use 2 full caps per 5 gallons of water. Ingredients: Water (filtered), Cocamidopropyl Betaine (plant based surfactant), Sodium Lauryl Sulfate (plant based surfactant), Lauramine Oxide (plant based surfactant), Caprylyl/Capryl Flucoside, Glycerin (vegetable), Sodium Chloride, C10-16 Alkyl Flucoside, Citrus Aurantium Dulcis (Orange Peel Extract, Citrus Aurantium Dulcis (Orange) Oil, Sodium Carboxymethyl Inulin (plant based chelant), Citrus Grandis (Grapefruit) Seed Extract, C10-16 Alcohols (plant based). Keep out of reach of children. CAUTION: In case of eye contact, flush with cool water for 15 minutes. In case of ingestion, do not induce vomiting; drink plenty of water to dilute.